I walk into the main hallway of my apartment building. Observing everything around me from the marble tile on the floors to the immaculate chandelier hanging from the ceiling in the middle of the hall, with a circular table directly under it. As I walk in from the street there is a white couch on the left side of the lobby right across from the attendant desk. I walk over to the front desk and smile at the attendant sitting behind the desk. Her name is Ann, ever since I’ve moved into the apartment, a few months ago, she has been my only friend. Ann is 35 years old and she has a husband and two kids, one boy one girl; the girl is seven years old and the boy is nine years old. She shows me pictures of her family all the time and tells me beautiful stories about them too. It makes me feel more comfortable with my move from California to Massachusetts. Sometimes I think I made a bad decision, but Ann makes it all better. About two years ago I received a book deal that still seems unbelievable. I’d been blogging for a while about romance. It started off as a hobby. Slowly I began getting subscribers and people responding to all the articles I was posting. Eventually my fan base spiked to over 4 million subscribers. Throughout the beginning days of my success no one knew who I was. I never revealed my name, I just refer to myself as the ‘Romance Queen’. It became a phenomenon that people would hashtag ‘Romance Queen’ on their social media post, hoping that I would give them advice. I would spend hours on only trying to respond to people through social media and through my personal website. One day a lady by the name of Linda Fox sent me an email saying that she had an extraordinary opportunity for me. I ignored her first email because I thought it was a scam, but she sent another message through social media. I did some research on her and she is well known in the industry as an author. Linda and I set up a day to meet, but I was nervous about revealing my identity to someone. I decided to send my best friend, Cindy to my meeting for me. Turns out it’s the headquarters for a company called ‘Elite Women’ which is focused on giving talented women a platform to brand themselves. They aren’t a huge company by they have many wealthy investors. Long story short they drew up a contract for me to publish a book by the ‘Romance Queen’. I didn’t know anything about writing or how I would go about writing a book, but I had the help of their editors. Once I finished my first book I titled it ‘Secrets to Keep Your Romance on Fire’. In the book I talk about things a lot of my subscribers have never read by me. I let it all out, it’s the raw truth. The only thing that really upset me was that I didn’t know much about the art of writing. I spoke to my team and voiced that I would like to go back to school, and they mentioned that I wouldn’t have been the first one to do so through the company. I immediately did some research on the top schools for literature and romance and I was pointed to the one and only Harvard University. I was determined to go back to school, but I was dreading, that I had to go to Massachusetts. I picked up everything I had and moved. I still speak to my friends here in there and my parents. ‘Elite Women’ are supportive of me expanding my knowledge in literature, they’ve even offered to help me financially. I know in all actuality they just want a few more books out of me. I sent in my application for Harvard University before I moved, hoping that I wouldn’t have to wait long before I got accepted. I’ve had Ann on lookout for my acceptance letter since I moved in. “Good Morning”, Ann says as she smiles. “Good Morning”, I say returning the smile. “Here’s the mail that I have for you today”, she says slightly disappointed. “The anticipation is killing me”, I say going through the mail. “You will get in”, she says sincerely. Ann reminds me of my mother because she always tries to encourage me, which is something I need right now. The next thing I know my next-door neighbor, Michael comes walking down the spiral steps and Ann does this eyebrow thing to indicate that he’s coming. I have been crushing on Michael since the moment I walked into this building. The first day I saw him he was returning from a morning run. I was struggling to get my bags in the building and he offered to take them upstairs for me. Ever since then I can’t stop thinking about him. I haven’t been able to have a full-length conversation with him because of the way he makes me feel. Anything I know about him is from Ann and I have a feeling she’s not telling me everything. No guy has ever made me feel the way Michael does. I’m usually very straightforward but whenever he’s around I normally just leave the scene. Before I see him, his pit-bull ‘Pretty’ starts licking my leg. I smile and pet her then I see him in a T-shirt, sweatpants and flip-flops; the norm. “I apologize, she can’t help herself”, he says. “It’s okay, I don’t mind”, I say before looking up at him. Every time we make eye contact there’s this weird tension between us. I just step back, grab my mail, and head up to my apartment. Once I get in my apartment I head straight to my office, which is the only room that is assembled and organized. Although the book is done I still have to keep up with regular blog post that have gotten more frequent and come up with more ideas for book two. I’ve been a bit overwhelmed. I haven’t had time to decorate my apartment, the same way the movers brought the things in, is the same way that they still are. This is when I wish I had my friends or family to help me. I spent the next hour making post after post, responding to all the people with romance issues. Being the romance queen. Suddenly I hear a knock at the door, I quickly get up because I know exactly who it is. When I open the door, Turner stands in front of me. I step aside so that he can walk into the apartment and I hear rattling of keys to the apartment next to mine. Once I put my head out to look no one standing there but the door shuts. I walked back into my apartment and close the door behind myself. Then turn back to my house guest and smile. He slowly walked up to me and begins kissing me. Comment Below…Thanks for reading!!! MuaH!!! Rapper YG released a visual for the track “Big Bank” featuring Nicki Minaj, Big Sean and 2 Chainz. The track will be featured on his Stay Dangerous upcoming album. 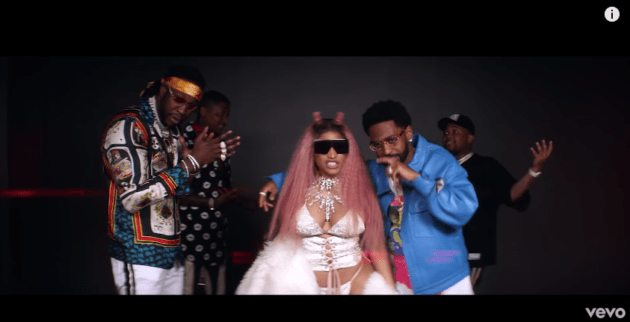 The non-stop visual feast features 2 Chainz delivering his verse while two police officers hold him at gunpoint, Big Sean parading around the Oval Office in a Colin Kaepernick jersey and Nicki Minaj atop a pink plastic horse. Stay Dangerous, YG’s follow-up to 2016’s Still Brazy, arrives “Summer 2018,” according to the album’s preorder page. On August 5th, YG will host a Stay Dangerous concert and 4Hunnid fashion show at Los Angeles’ Microsoft Theatre; every ticket to the show comes with a digital download of the rapper’s new LP. Chris Brown dropped the video for Hope You Do. The track is featured on Brown’s eighth album Heartbreak On A Full Moon. The video embodies a black and white old school feel. He remakes Donell Jones – Where I Wanna Be with his chorus. I thought Heartbreak On a Full Moon was a depiction of what my soul wanted to say. It’s funny because we’re doing a double album. I’ve done so many records, but all of the records, to me, are personal favorites and I feel like it gets what I want to say across. It gives a vibe. You get nostalgia or you get a sense of individuality. After an eye-opening 2017 season, which caused NFL attendance and TV rating dropped as Trump and other critic’s scrutinized on-field protest by many of the league players. NFL commissioner Roger Goodall announced this week that the league has a new policy, “this season, all league and team personnel shall stand and show respect for the flag and the anthem. Personnel who choose not to stand for the anthem may stay in the locker room until after the anthem has been performed”. The new policy stem from all of the opinion’s after former San Francisco 49ers quarterback Colin Kaepernick, shocked the world when he decided to Neil for the national anthem before a preseason game and then before regular-season games throughout the 2016 season. The protest let some to boycott watching NFL games last season and it appeared to have played a part in NFL’s ratings. Television viewership fell 9.7% across all networks last season, according to Nielsen data. An average NFL game was watch by 1.6 million fewer people compared to last year, declining overall from 16.5 million $14.9 million, ESPN reported. Although their ratings have dropped, the NFL still signed a $1.5 billion deal with Verizon to stream games across the wireless carriers platform, according to Recode. The NFL also reached a five-year, $3 billion to broadcast Thursday night Football on Fox sports, according to Reuters. The problem with this entire policy is that it effects the 70 percent of football players that are African American feeling the injustice in this country. Colin Kaepernick and other players have said they are not protesting the anthem or the military; they are using the anthem to bring attention to racial injustice and the issue of police abuse of black and brown Americans. Below is the video of Sterling Brown being arrested for a parking violation brings up Kaepernick’s point. HBO releases the first trailer for the television show dedicated to Ray Bradbury’s classic sci-fi novel Fahrenheit 451. Michael Shannon stars as the sheriff and Black Panther star Michael B. Jordan plays Guy Montag a young fireman. In this world fireman burn books and they rewrite history.